Before we get to the “how” of conducting a competitive market analysis, let’s talk for a minute about the “why.” Why is it worth your time to collect and review information about what your competitors are doing? “Most people conducting a competitive market analysis are trying to understand how their business, product or brand is positioned,” said Sherry Smoak, assistant professor and director of the D.K. Hardin Center for Market Research. In a crowded marketplace, you want to give clients a reason to pick you over anyone else. A competitive market analysis defines effective methods of reaching your customer base, reveals opportunities for outperforming the competition and delineates where your resources are most needed. This may sound basic, but if you don’t know who you are up against, how will you know how to outperform them? Push beyond the temptation to narrow your focus on just your No. 1 competitor in your competitive market analysis. Think about it as an array: Who are your primary competitors? Your secondary ones? And who is in that third group, the one that may not be on your horizon right now but is nibbling around the edges of your customer base? A Google search can turn up firms that weren’t even on your radar; search for whatever product or service you are offering and see what comes up. Do the same with social media channels. And you can still unearth information the old-fashioned way: through annual reports, trade associations, financial filings and databases, and local newspapers. These platforms, among others, provide clues to your competition’s sales approach and target market. Be sure to assess quality, not just quantity. How engaging is their content? How up-to-date is it? How often and where is new content added? What are the gaps that your business could bridge? Websites have structure, and the better the structure, the more likely the site will get a high ranking in search engines. To get a feel for how customers might use your competitor’s website—and how search engines latch on to it—click every link in the header and dropdowns. Click every link in the footers. And, yes, click every link in between. Start a list of web page titles, URL architecture, H1 tags, internal links, image text and, of course, keywords. Again, assess what they are doing well and where they have left holes for you to fill. Social media is an indispensable way to interact with users and fans and share your content, but everyone uses it a little differently. How do your competitors show up on social media? What do their profiles say? What do they post and repost? How often? Do they use images? Photos? Just as importantly, who is following them? Who do they follow? Each social media site has its own thumbprint, so examine the differences (and similarities) among Facebook, Twitter, LinkedIn, YouTube, Snapchat and Pinterest. Now you have a complete picture of who your competition is, what content they are creating, how they design their website and which social media platforms they engage in. You are able to identify where you need to improve and how to invest your resources to not just keep pace with your competitors, but to stay a step ahead. More and more people are realizing that with the amount of data we can get our hands on now, students need to know how to process this data and use it in a meaningful way. Want to do more? 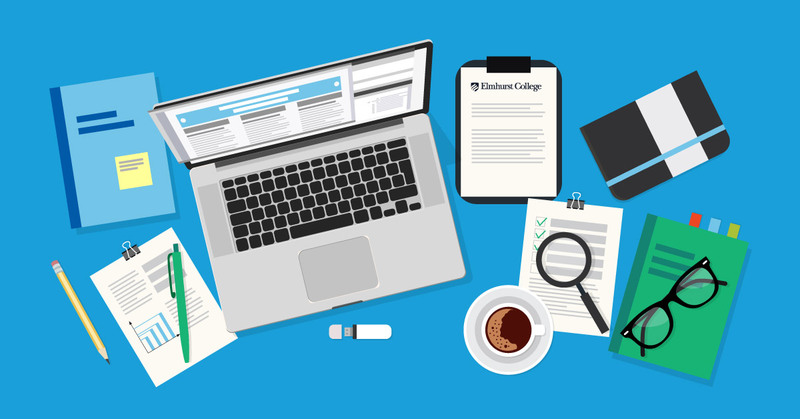 At Elmhurst College, we offer a graduate certificate program in market research. You’ll get hands-on experience in projects that are applicable to numerous business settings, including marketing management, product and brand management, research analysis and consulting. Classes can be taken online or on campus, or a combination of the two.